A scene from Monáe’s “PYNK” music video. 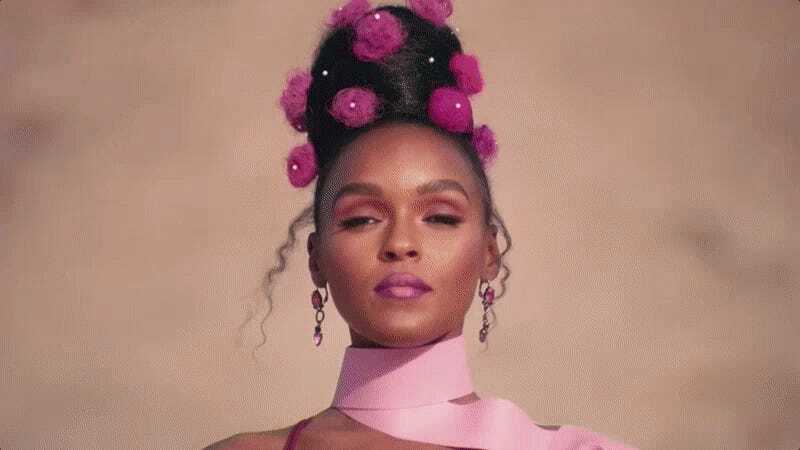 It’s been nearly five long years since Janelle Monáe invited us back into the magical neon wonderland she’s dreaming up with her previous musical work, but the wait is finally over. Dirty Computer, her third album, is about to drop—and it’s coming with a 50-minute-long scifi film in tow. While Dirty Computer is reason enough to get excited all on its own, Monáe is releasing a nearly hour-long “emotion picture” that will begin a new story about a woman on the run from an authoritarian government in a dystopian future, where people labeled “deviants” have their memories forcibly removed. The woman, played by Monáe, sets out on a journey to find her love interest (played by Tessa Thompson) and each music video included in the film represents one of the missing memories. “PYNK”, one of the music videos included in Monáe’s “Dirty Computer” emotion picture. The accompanying emotion picture to “Dirty Computer” is definitely the sort of art one imagines Monáe’s been sitting with and honing for years now, and what makes it so exciting is that it’s dropping as a single cohesive story all at once—a shift from her previous visual works were usually spread relatively far apart. From the buzz surrounding it, it sounds as if Dirty Computer is a major milestone in Monáe’s evolution as an artist and she’s inviting everyone to witness it firsthand. Dirty Computer drops April 27. UPDATE: Variety’s now reporting that the “Dirty Computer” short film is set to premiere on both BET and MTV on April 26. Mark your calendars, people. Are Janelle Monae&apos;s science-fictional lyrics keeping her off the radio?